The Silly Game of Sketchy Directions! 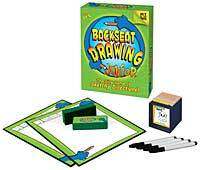 Backseat Drawing Junior brings the outrageous fun of Backseat Drawing to the entire family. Players race to identify a drawing done by the â€œartistâ€�â€” but the artist doesnâ€™t know what he or she is drawing! Itâ€™s up to the â€œdirectorâ€� to tell the artist how to draw the picture without giving away the name of the item shown on the picture card.